Dear God, I haven’t been this scared in years…and it takes a lot to scare me. Such a horrible evening. I knew we were in deep trouble when they said Reed Timmer (a well known tornado hunter) was following the storm. At 5:30pm I had cleaned out the downstairs closet, put Whirl in her carrier in the back when the sirens started. The weatherman said the tornado was headed straight for Maumelle after it had formed. We scrunched into the closet, Tom wrapped a rope around the door handle and then himself. We listened as the local news kept saying it was coming our way and we are in the northwest section of Maumelle , the direct path. Then the lights went out. I braced myself and prayed that I wouldn’t start feeling the air being sucked out of the closet. Everything was eerily still…. And green. The tornado turned to the northwest, away from us. 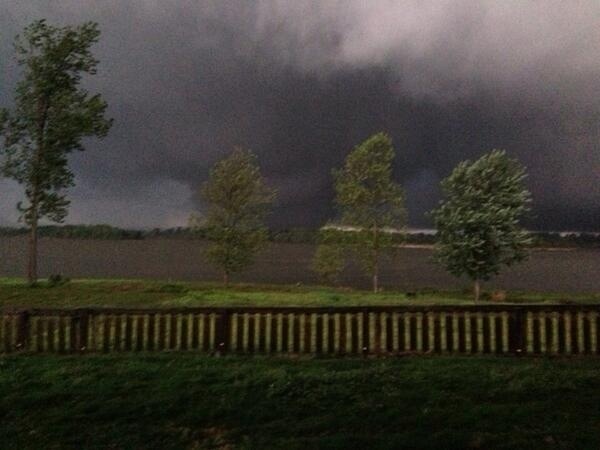 The photo below was taken by a young boy as the tornado passed about 5 miles west of us and headed for Mayflower. As I write this it’s going on 5am here, still thundering and very humid outside. I think I can safely go to bed soon. I told Tom tonight that I couldn’t take this anymore and I’m going to install a tornado shelter… No matter what it costs. Our son, Richard, just moved to Jackson, Mississippi this past week and started a new job at the U of M Medical Centre there. He’s getting one hell of an initiation into weather in the deep south. I’m going to bite the head off my chocolate Easter bunny now.